Luis Suarez gained a lot of reputation at the 2010 World Cup for his fantastic performances which achieved Uruguay a semi final spot on the grandest stage. 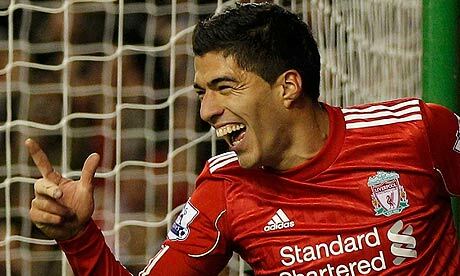 Suarez, playing for Ajax, was wanted by most clubs but chose Liverpool due to the tradition and history of the club. Since joining one of the biggest clubs in the world, he hasn’t failed to impress with his great ball control and deadly finishing. His goal scoring record at Ajax was fantastic, and if he continues that particular form of Liverpool (so far showing that he can) then he will become one of the best strikers in the world, and one of the best in Uruguayan history. Luis Suarez played in the Uruguayan league, but was spotted by Dutch club FC Gronigen. He would only play their one season however, and his impressive performances would attract interest from all clubs around Europe. He chose to stay in Holland though and join Ajax. Despite Suarez scoring a lot of goals, he wasn’t the most liked fan in the league, and maybe opposition fans started to boo him. Suarez would often get yellow cards for stuff he didn’t need to do. He was announced as Dutch football of the year at the end of 2009/2010 season and was chosen to play for Uruguay at the World Cup in South Africa. Suarez did impress in this tournament, scoring his first goal against Mexico which helped them win the group, therefore avoiding Argentina in the next round. Suarez scored two great finishes against South Korea in the round of 16 and looked a player in top form. The most controversial part of his career happened in the quarter finals against Ghana, where he handballed on the line to stop a clear goal. He was sent off for this, and Ghana missed the penalty to which he celebrated wildly, which caused many fans to be infuriated with him. Suarez joined Liverpool, and has already impressed in his 6 months there so far, including a good performances against Mancester United where he took on many players before setting up Kuyt to score. Suarez has scored several other goals for Liverpool and his partnership with Andy Carrol is being talked up as arguably the best strike force in the Premier League. Liverpool are talked about as a potential side to win the league, because of the quality they have at their disposal, including Suarez. Suarez is a intelligent player who knows where the goal is and quickly building a reputation, and is still only 24.